A little love is all any"bunny" needs! 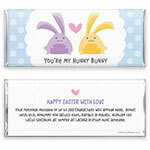 This sweet candy wrapper is a wonderful choice for Easter. This custom printed wrapper will be “fully assembled” around a 45g Belgian Milk Chocolate bar with your choice of silver or gold foil. Made from only the finest quality 100% Belgian milk chocolate offering a premium taste and a smooth, luxurious “mouth feel”. 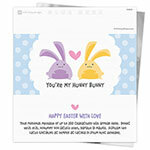 Design: Illustrated bunnies with heart and polka dot background. Personalization: Front message, back title and message. Ingredients: Sugar, cocoa butter, full cream milk powder, cocoa beans, vanilla, soy lecithin (an emulsifier). Mfg. on equipment that also handles products containing nuts, eggs, wheat flour, dairy, soybeans.